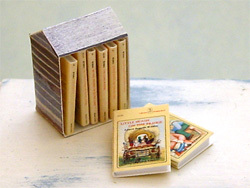 I love the Little House books, they were part of my childhood too, and I love the miniature set I got from you for my 70's house! I'm really glad you like them, Gaye! Your mini 70s house is so cool. This wasn't really a miniatures post (although these books have inspired some of my minis) but I know a lot of miniaturists are very fond of the Little House series so I thought people would be interested. Wouldn't it be cool to own some of that original artwork?